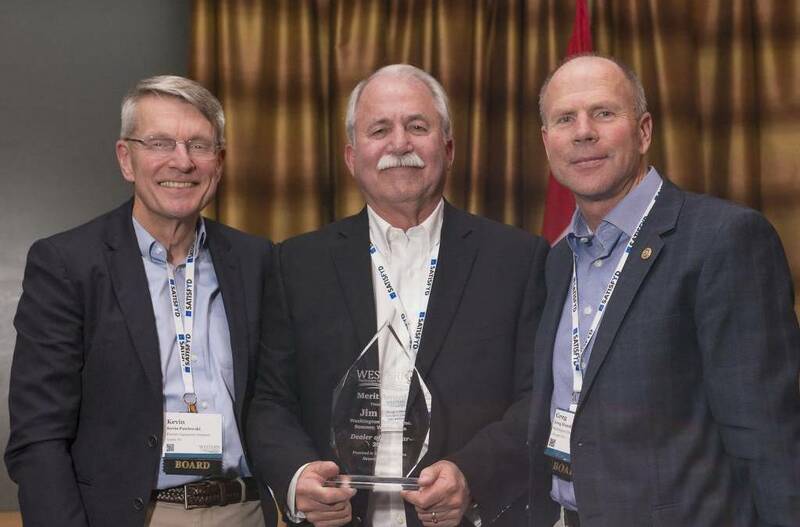 Kansas City, MO, December 7, 2017 – The Western Equipment Dealers Association (WEDA) is pleased to announce that Jim Hale of Washington Tractor is the 2017 Dealer of the Year. Jim Hale was born in West Seattle to a stay-at-home mom and a dad that worked for Bell Telephone Company. He spent many summers as a child at a ranch in eastern Washington that belonged to a family friend. This led to a lifelong passion for ranching and farming that would ultimately shape his life. When he graduated from Chief Sealth High School in 1963 he took a summer job working at the local Cat dealer (N.C. Machinery). He went on to study at Yakima Junior College before transferring to Cal Poly San Louis Obispo and in 1967 he graduated with an Ag Engineering degree. After college, he went to work at Webb Tractor in Yakima Washington for one year; that is when the dream set in to be a John Deere Dealer. In 1968, he joined the Air Force and completed pilot training. In 1971, he went back to work for the former Webb Tractor, which had become Simco Equipment as a John Deere Ag salesman. In 1973, he moved to Lynden, Washington where he worked as the Vocational AG Teacher at Lynden High School while he built his home during the evenings and on the weekends. In 1976, his career at North Washington Implement would begin. He started out as a salesman selling equipment to dairy, berry and seed potato farms. In 1980, he purchased the first half of the dealership and in 1990 would become the sole owner. In 2010, Washington tractor was established when three family-owned and operated John Deere Dealers become one. In 2012 Hamilton Farm Equipment would join to create the current family of ownership. In 2013, Washington Tractor purchased three additional Barnett dealerships. Today, Jim Hale oversees a total of 12 locations to become Washington state’s largest power equipment dealer. With a century of doing what’s right to build trusting relationships with their clients, Jim worked to establish a dealership that is founded on values bringing dedication, service and commitment to quality to their customers and their work in serving the community. Jim Hale has maintained Washington Tractor as a pillar in the business and agriculture communities, demonstrating care and concern for their fellow community members. From his family, peers, community, fellow dealers, employees and customers, Jim has swathed a path of respect, integrity, fairness and honesty. “I have always looked up to Jim as a leader in our industry and in his community. He was instrumental in facilitating our merger with Washington Tractor for which I am eternally grateful,” Greg Hamilton, Washington Tractor. For more information about the Western Equipment Dealers Association or the Dealer of the Year award, contact Carolynn Sinclair at csinclair@westerneda.com or (800) 661-2452.